Henry Cu Kim He got involved in the Korean independence movement through the Korean National Association and mass media. Henry landed in America in 1909 after he was exiled to China. He received a military training in Nebraska for future independence struggle from Park, Yong-man there. He proceeded to study further to earn a BA degree from Columbus College in Ohio and later he got his Ph.D. from Cal State University. He later became an editor- in-chief of Shin Han Minbo instilling the need of Korean national independence and he authored articles for Korean National Association from 1919 to 1927 period. He was so diametrically op- posed to Syngman Rhee’s policy line that he wrote a critical piece: “Biography of Woo-nam Syngman Rhee.” He was brutally attacked by terrorists sent from Rhee. Later, Henry was able to get rid of factions working with Rhee in 1932 by closely cooperating with the Provisional Government headed by Kim Goo who personally thanked Henry. Thereafter, he was active in promoting diplomacy for Korean independence by publishing ‘Eight-Year Plan for Independence Movement’ extending from 1927 through 1929. 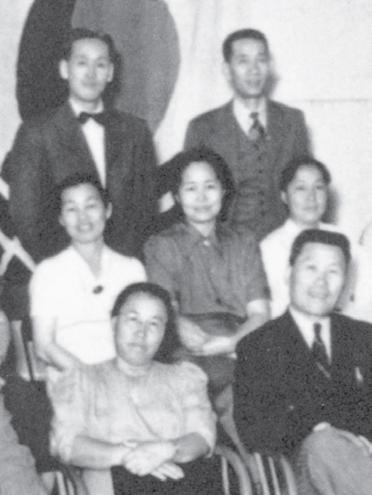 He finally served as president of Hawaii Korean National Association in 1951. He authored his autobiography and three high-pro-file figures in the Korean community. He died in 1998, the Korean government repatriated him to Daejeon National Cemetery. In 1995, the South Korean government posthumously recognized him with the Order of Merit of National Foundation / Patriotism Award for his service and dedication for Korean independence. ◀ Henry Cu Kim standing on the right handside in the rear row picture in Hawaii (1942).